All six of our migrating Swallow-tailed Kites from Florida and South Carolina are now in Brazil. They are enjoying the benefits of an insect buffet through the Amazon and the Cerrado, Brazil’s vast, tropical savannah. Palmetto, from the lowcountry of South Carolina, is slowly moving south through the state of Acre, 150 miles north of the Bolivian border. Gulf Hammock, maneuvering along Bolivia’s northern border, is spending time now in the flood plain of the Rio Mamore. Pace made his way southeast in the last week and is roving over agricultural lands near Rolim de Moura, Rondonia, Brazil. Day had a very similar, almost parallel track to Pace. She continued on through Rolim de Moura, however, and is now 65 miles east of Pace. In the last week she has covered about 570 miles, approximately the distance from Miami, Florida, to Charleston, South Carolina. Suwannee’s travels this week, of about 540 miles, carried her from the middle of the Brazilian Amazon to an area about 45 miles west of Ariquemes, Rondonia, Brazil. MIA, ever faithful to his independent ways, is the southeastern outlier. He has been exploring the State of Mato Grosso, Brazil, looping from Lucas do Rio Verde in the north to Rosario Oeste in the south. We're back from the field! And happy that all the kites look to be doing well and moving strong since our last full update on Aug 21st. Palmetto (Female) - Tagged in Palmetto Bluff, South Carolina. 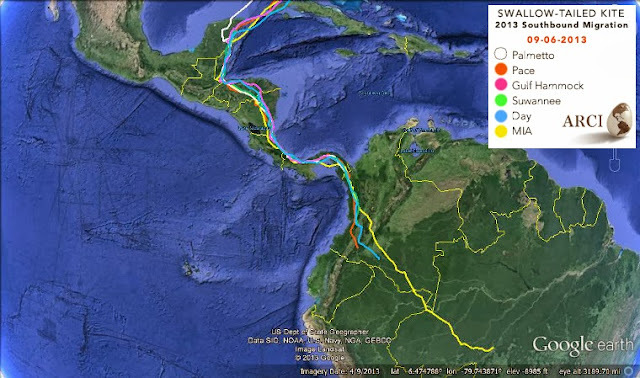 Palmetto stayed in Mexico for 8 days and finally resumed her southward migration on August 18th. 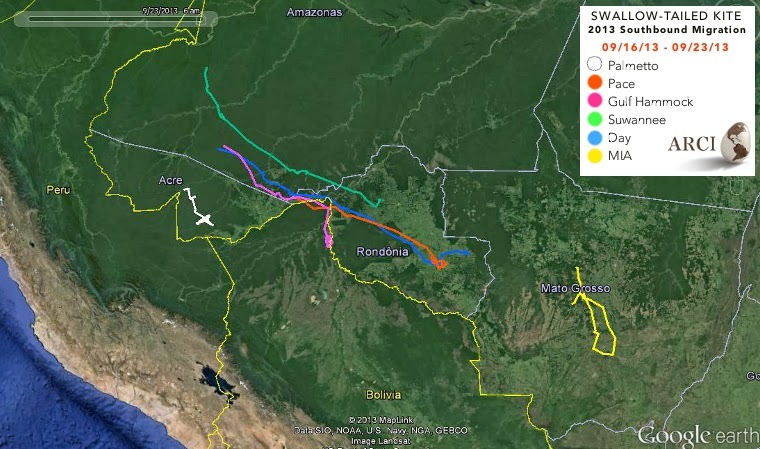 She moved steadily on, foraging and resting along the way, for 11 days and approximately 1,300 miles, until she made it to the Colombian border in Panama’s remote Darien National Park. Pace (Male) - Tagged south of Jacksonville, Florida. It took Pace 9 days to travel through Central America, starting in Belize, to the border of Colombia. He kept a steady pace through the country and has crossed the Andes just north of San Juan de Pasto, a town where there is a narrow pass through which the birds are able to cross the rugged Andes range. Gulf Hammock (Female) - Tagged in Levy County, Florida. Gulf Hammock was our last Florida-tagged Swallow-tailed Kite to leave the country. Once she moved, she did so quickly and without a stopover on the Yucatan Peninsula like most of the other tagged birds did and many Swallow-tailed Kites are known to do. This may be due to her prolonged pre-migratory staging, where the extra time to fatten up gave her the energy to keep moving south. From the tracking data, we see that she likes to fly near coastlines, which is a great navigation aide. Gulf Hammock is now nearing the Colombian border with Panama. "Suwannee" – Female. Tagged at the Lower Suwannee National Wildlife Refuge. Suwannee continued steadily through Central America and into Colombia. She safely crossed the Andes and is now over forested lands of the Caqueta region of Colombia, the boundary area between the Andes and the Amazon. Day (Female) - Tagged in Daytona, Florida. After a week in Quintana Roo, Mexico, Day trekked another 11 days crossing most of Central America. In the last 8 days she slowly moved through the Choco of Colombia, the most undeveloped state in Colombia and also one of the world’s great biodiversity hotpots. She is now near the town of Cali and about to cross the Andes. MIA (Male) - Tagged in south Miami, Florida. MIA gets the award for being the speed champion migrant. He made it through the Andes on August 15th, shaved over the northeasternmost corner of Peru on August 21st, and continues to sail through the Brazilian Amazon. He has traveled roughly 3,500 miles in 5 weeks.